If accepted for membership, I pledge to respect the laws of the United States. I understand that Nigerian-American Community Association (USA), Inc,. regulates the use of NACA (USA), Inc., name & emblem and I cannot use same on advertising, card, etc without the express permission of the Nigerian-American Community Association (USA), Inc. 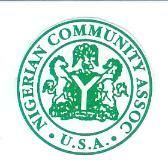 I hereby declare my desire to apply for membership in the Nigerian-American Community Association (USA), Inc. I agree with the aims and objectives of NACA (USA), INC., as outlined in the Constitution and Bylaws, and I shall conform to all said rules. I pledge to respect all laws of the United States of America. I also attest that I am qualified to apply for membership, and that the information supplied by me on the application is both accurate and truthful in applying for membership, and that any misrepresentation or deception on my part will be grounds for denial of my application or expulsion from the association.